Zia Dantes entertains crowd with her own rendition of the Disney song "How Far I'll Go." 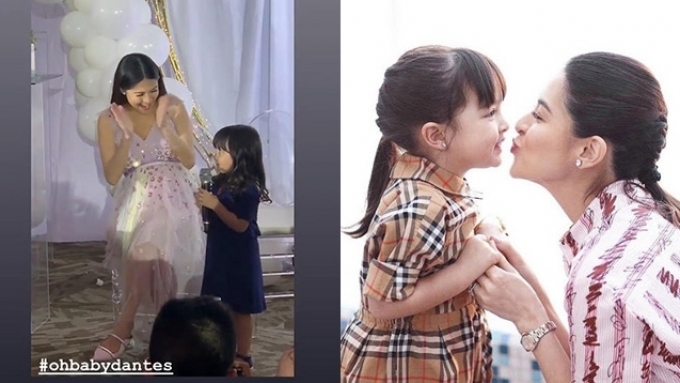 Zia Dantes charmed the guests with her singing talent at the baby shower of her mom, Marian Rivera. The three-year-old daughter of Marian and Dingdong Dantes sang "How Far I'll Go" from the Disney film Moana. Marian, who is pregnant with her second child, cheered on her firstborn. From the audience, Dingdong was also quite the stage dad as captured on Instagram. After entertaining everyone with her performance, Zia sat beside her mom and gave her soon-to-be baby brother a message. Zia made the promise to "take care of my baby brother and love my baby brother." A number of GMA-7 stars were spotted at Marian's #OhBabyDantes baby shower held at The Marquis Event Place in Bonifacio Global City, Sunday, February 24. Jennylyn Mercado and Sheena Halilli were among the attendees. Bettinna Carlos, who is one of Zia's ninangs, served as the event's host. Marian's Sunday Pinasaya co-regular, Ai-Ai delas Alas, also came. Ashely Ortega, who co-starred with Marian in the Kapuso series, Super Ma'am, personally congratulated Marian. Marian's closest friends Joylyn Gonzales, events planner Teena Barretto, comedian-host Boobay, and actress Ana Feleo were also present.